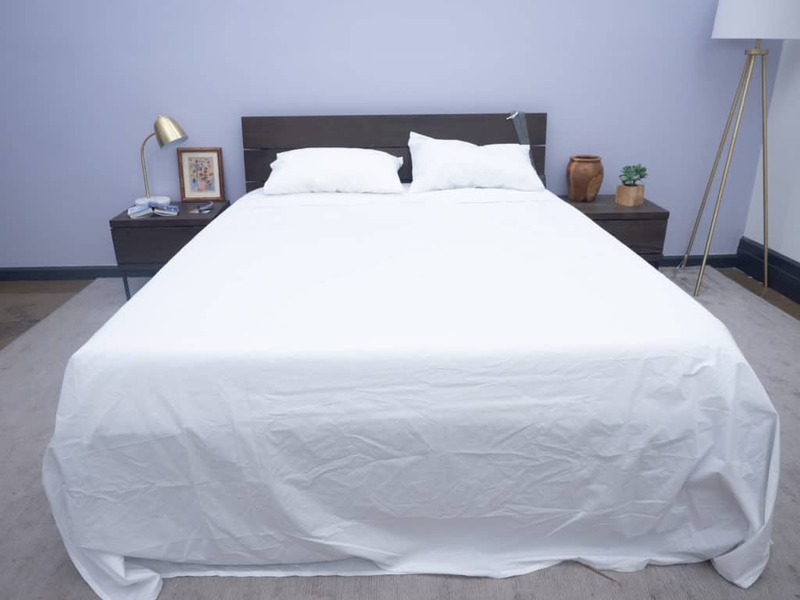 Brooklinen Sheets Review - Should You Buy Them and is Percale for You? When you’re on the hunt for that classic set of white cotton sheets, you might be overwhelmed to find that there is an ocean of options. So, how do you wade through all those sheet sets to find the one that’s right for you? Well, Brooklinen designed the Classic Core sheet set for folks in search of this popular bedding essential — and Sleepopolis is here to test it out. 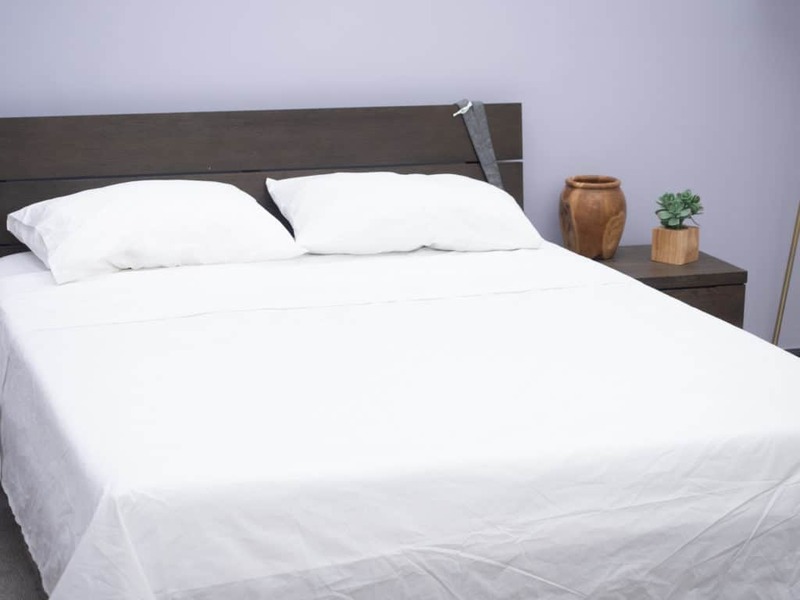 In this review, I’ll be taking a close look at the Classic Core sheet set from Brooklinen. I’m going to examine what these sheets are made of, how they perform, and what sets them apart from the rest so that you can determine if they might be the sheets you’ve been looking for. No need to worry if you don’t have time to read the full review, you can click here to skip to the summary! WHAT ARE BROOKLINEN SHEETS MADE OF? These sheets are made from 100% long-staple cotton and feature a 270 thread count, which the folks at Brooklinen say is intended to offer a soft, breathable, ‘hotel bed’ feel. The Classic Core set consists of percale woven sheets, though Brooklinen does offer the Luxe Core set which includes sateen woven sheets. So, the Classic Core sheet set that I’m testing here is going to provide more of a cool, crispness as is generally characteristic of a percale weave. When you’re thinking about how percale and sateen compare, it’s generally a safe bet to assume that percale bedding will be more crisp, and sateen will be more smooth. As I said, these sheets are designed to be light and breathable which is likely to make them particularly compatible with hot sleepers. In keeping with the classic percale personality, these sheets also feature a matte finish (which means they don’t appear shiny at all). Instead, they offer more of a crisp, white, dress-shirt aesthetic. Each sheet set includes one fitted sheet, one flat sheet, and two pillowcases. The fitted sheet is capable of accomodating mattresses up to 15 inches deep, so I had no problem dressing my mattress which is 11 inches deep. Additionally, the sides of the fitted sheet are labeled “short” and “long” so that sleepers can dress their mattress right the first time without all that fitted- sheet-shuffling. Both pillowcases use envelope closures (which is a personal preference of mine) offering a small piece of fabric that covers the pillow inside. This way, you can’t see inside of the pillow, and you don’t have to worry about the pillow/tags spilling out of the side. My first impressions of these sheets is that they definitely have what I refer to as a classic percale personality. They are crisp, cool, airy, and offer that hotel bed aesthetic. So, now that we know what these sheets are made of, let’s take a closer examination of how they feel. HOW DO BROOKLINEN SHEETS FEEL? While percale sheets do tend to feel light and airy, this sheet set feels even more so than some other percale sheets I’ve tested — and they are very crisp. I’d say the people at Brooklinen got it right when they compared these sheets to a “hotel bed feel.” Of course, not all lodgings use the same bedding, but you might find that white, cotton, percale sheets like these are frequently featured throughout most vacations you take. The light, breathable nature of these sheets does enhance airflow which helps to dissipate body heat. So, warm sleepers might be especially compatible with these sheets. In fact, because they are so lightweight, they might not be so well-suited to colder climate. After rolling around in these sheets, I definitely got the impression that this bedding would be a go-to in the summertime. The percale weave that Brooklinen uses for these sheets creates a very crisp feel, sort of akin to a freshly ironed dress shirt. However, the crispness of these sheets does contribute to a bit of a crinkling noise when you press into the fabric. Again, this can be common with percale woven sheets, but it’s worth noting that these sheets do make some sounds when you rub against them. These sheets have a classic matte finish (as is usually the case with percale), but they are also more prone to wrinkles. Fortunately, these sheets are machine dryable, so I recommend pulling them out of the dryer as soon as the cycle is finished. Spreading them out over the mattress when they are still warm should help keep the wrinkles at bay. The fitted sheet’s elastic band is firm and responsive, helping it to stay put on the mattress. But remember: if your mattress is deeper than 15 inches, this particular sheet set will not work for you. I used a mattress that is 11 inches deep, so I was able to tuck the excess fabric underneath the mattress for a very snug fit. I will say that I really enjoyed the labeling of the fitted sheet as it made the whole bed-making process quicker and easier. Overall, these sheets feel lightweight, breathable and oh-so-soft. And while they do meet the general characteristics of percale woven cotton sheets (wrinkles included), I found these to be exceptionally cool and crisp — ideal for sleepers who run hot. But remember, sleepers: the Classic Core sheet set is not the only bedding Brooklinen has to offer. This percale woven set comes in a variety of colors and styles from navy blue to windowpane, but the company also offers sateen, linen, and twill woven sheets as well. It may take a little researching, but I recommend browsing the full range of bedding in order to find the absolute best Brooklinen sheets for you. HOW DID YOU LIKE BROOKLINEN, SARAH? 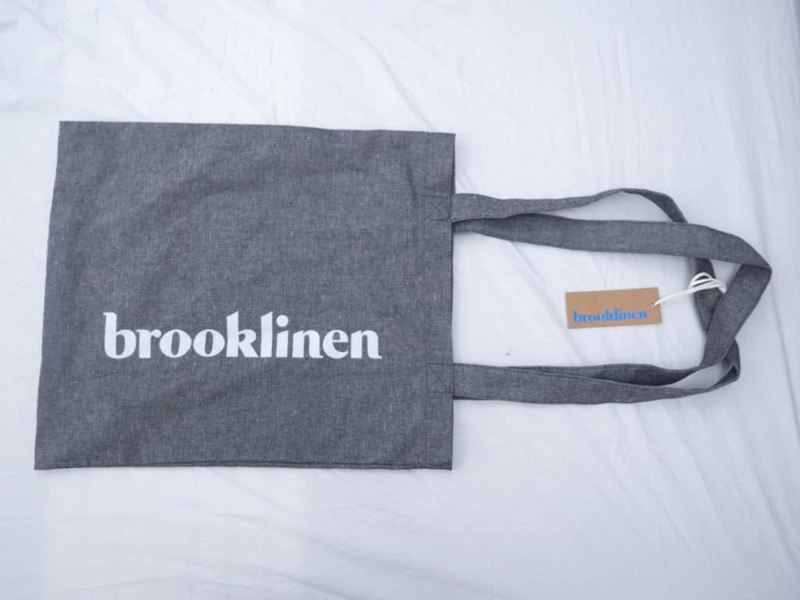 Before I get into my opinion of these sheets, I just want to take a second to acknowledge the cute Brooklinen tote bag in which they arrived. Not only is it a charming charcoal color featuring the brand’s logos in white, but the bag itself feels quite durable! You could obviously use it to store your sheet set during its off-season, but you could also use it to carry your books, gym clothes, and other knick-knacks as well. Personally, I love when bedding sets come with little bonuses like that. After I removed the sheets from the tote bag and began making the bed, I was pleasantly surprised to find the “long” and “short” labels inside the fitted sheet. I’m sure I speak for us all when I say that fumbling about with the fitted sheet in an attempt to find out which side goes where is pretty annoying. So, I like that Brooklinen kind of took care of that for me; I’m a fan of anything that’s going to get the bed made faster. As I finished dressing the pillowcases, I could already tell that this sheet set is light, airy, and cool. To me, it was easy to see why Brooklinen calls it the “Classic Core” because it does have that soft, crisp-cotton feel that many of us have come to know so well. But after thoroughly rolling around in this bedding, I noticed a few things that set these sheets apart from the other percale sheets I’ve tested. Firstly, after fanning the top sheet over my body, I could feel the air flowing through the fabric in a way that was more than just breathable — it was actively cooling me down. The top sheet rested ever-so-lightly on my body, and I got the sense that this sheet set would be great for hot summer nights. However, if you sleep warm year-round (like me), I encourage you to give these sheets a try no matter which season it is. That being said, I was also getting the sense that sleepers looking for warm-and-cozy might not be quite as compatible with these sheets. They do feel soft to the touch, but they are very light, and super crisp. In fact, that brings me to my next point: these sheets are among the crispest percale sheets I’ve ever tested. So, if you’re a sleeper for whom sheets can never be too crisp, I strongly urge you to consider these. They really bring this hotel-bed meets button-down-shirt quality that made me feel comforted in both a luxurious and familiar way. One thing I did notice, though, is that these sheets wrinkle pretty easily. Such is often the case with percale, but I found these sheets to be particularly prone to wrinkles. Again, we see these sheets falling in line with the typical percale personality, but Brooklinen consistently takes it a bit further. They aren’t just a little cool, crisp and slightly prone to wrinkles. They are very much each of those things. I’m a combo sleeper, so I rolled from position to position to make sure the fitted sheet did a good job of staying on the mattress — and I am pleased to report that it did! However, I also noticed in my tossing and turning that this bedding is a bit noisy. It makes sort of a crinkling sound when you press into the fabric, and while it wouldn’t bother me while I’m asleep (I’m a very deep sleeper), I can’t say it didn’t bother me while I was awake. Ultimately, the crinkly sheet sounds and wrinkly creases were not enough to distract me from the cooling comfort of the Classic Core set. I found the soft and light breathability of these sheets to be quite inviting and, like I said, was impressed with the crispness. The Verdict: When it comes to these particular sheets, I’m extending the most enthusiastic recommendation to percale-loving folks who sleep hot. ARE BROOKLINEN SHEETS WORTH IT? Sleep Hot — In my opinion, these sheets will keep even the hottest of sleepers cool. After rolling around in these sheets, I could really feel the cooling breathability, and they did a great job of dissipating my body’s heat. Folks who sleep with the window cracked in January should definitely give these a go! Love a Crisp Feel — These sheets are super crisp. If you’re the type of sleeper for whom sheets can never be too crisp, I recommend giving these a try. They really have that fresh hotel bed feel that I think would definitely appeal to sleepers who are down with the crispness. Prefer Percale — This sheet set has a true percale personality. Sleepers who love the crisp, cool, lightweight breathability of percale should definitely give this bedding a try. HOW DO BROOKLINEN SHEETS COMPARE? Of the three other brands I’m comparing here, I’d say that Casper’s Cool Supima sheets are most similar to Brooklinen’s Classic Core. They too are made from 100% long-staple cotton, feature a percale weave, and (as you might have guessed) are designed to offer cooling comfort. The differences, in my opinion, lie mostly within the details. For example, the Casper fitted sheet features a much thicker, rubberized elastic band that offers a mega-grip on your mattress. However, it does not provide the labeling of “short” and “long.” Additionally, the Brooklinen sheets are a little less smooth and a little more crisp than the Casper sheets. Both sheet sets definitely offer that cool, crisp, cotton feel, but Casper’s sheets are a bit heavier in weight making them better for year-round use, while the Classic Core is more compatible with warmer weather. If you’re interested in learning more you can click here to read my full review of Casper sheets. Parachute’s percale sheets are light and breathable (as is often the case with this weave style), however they are also garment washed. So, they are going to offer what the company refers to as a “lived in” feel, making them a bit softer and less crisp than both Casper and Brooklinen sheets. It’s also worth noting that the other sheet sets mentioned here include a top sheet, but Parachute’s sheet sets do not. Sleepers are given the option to add a top sheet to their order, but it does come at an additional cost. 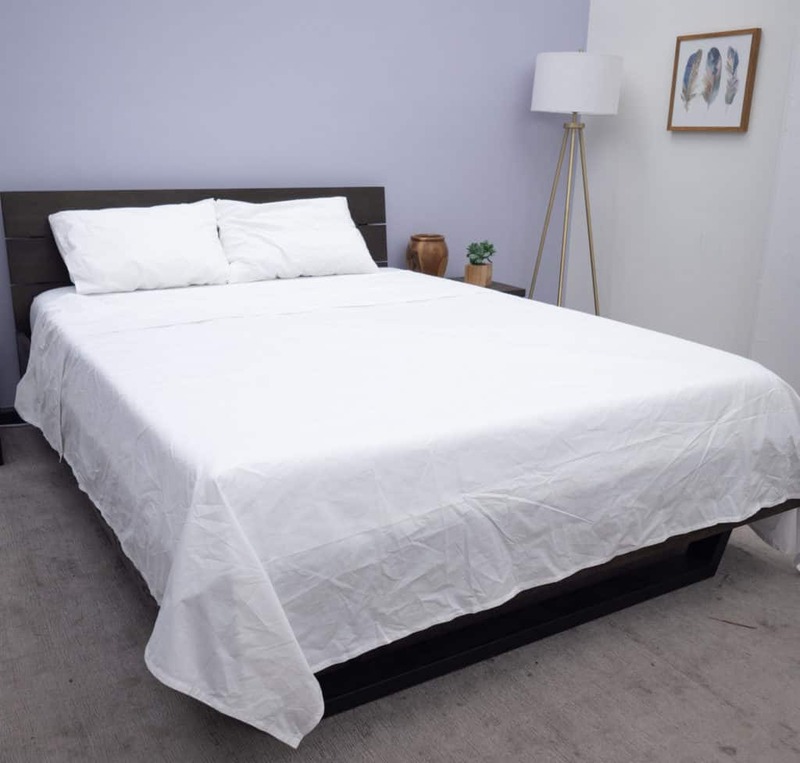 I would consider Parachute’s percale sheets to be the most dissimilar to Brooklinen’s as they are much less crisp, heavier in weight, and offer that special garment washed smoothness. You can read my full review of the Parachute sheets here. Snowe’s percale sheets are made from long-staple Egyptian cotton and feature a higher thread count than Brooklinen’s percale sheets. This leaves the Snowe sheets feeling a bit stronger, thicker, and perhaps more durable. Of all these companies, Snowe’s fitted sheets offer the deepest pockets. So, if you’re trying to decide between these four bedding brands, and you’ve got a mattress that’s 17 inches deep, go with Snowe. Ultimately, Snowe and Brooklinen sheets feel similarly in that they are soft, crisp, and offer a classic matte finish. However, Snowe sheets lie a bit heavier on the body and, again, might be better suited for year-round use than the percale sheets from Brooklinen. Very Crisp — Percale sheets are typically crisp to the touch, but these are even more so than other percale sheets I’ve tested. Some sleepers may even find the crispness to detract from the softness. Wrinkly — These sheets are prone to wrinkling, which is totally common for percale woven sheets. However, I found them to be even more wrinkly than other sheet sets I have tested. It didn’t detract from the comfort, but it’s not ideal from an aesthetic standpoint. Noisy — These sheets do make a bit of a crinkling noise when you press into the fabric, so that’s something for light sleepers or folks sensitive to midnight sounds to be aware of. Origin — Made in Israel, designed in the U.S.
Where to Buy — Sleepers are, of course, welcome to click the link above to purchase their sheet sets at brooklinen.com. But Brooklinen sheets, comforters, towels, and other products are also available on Amazon. Speaking of which, you’ll be glad to know that Brooklinen sheets have amassed stellar consumer ratings on both Amazon and Reddit. Lifetime Warranty — If there are any problems with your sheets as a result of manufacturing, Brooklinen will replace or exchange them free of charge. Care Instructions — The folks at Brooklinen suggest using natural detergents in a cold wash cycle. Tumble dry on low heat. Exchange Policy — Brooklinen accepts exchanges of unused, undamaged goods within 365 days of purchase. Return shipping cost for domestic orders is paid for by Brooklinen. Return Policy — You have 365 days to return these sheets. You will be completely refunded in the original method of payment if the sheets are unwashed and unused. Returns of washed or used items will be refunded by Brooklinen, minus a processing fee of $9.99. Made from 100% long-staple cotton, the Brooklinen sheets have a very nice lived in feel about them. The build is extremely durable and dependable. Not to mention, the sheets are designed to soften up after each wash and dry cycle. 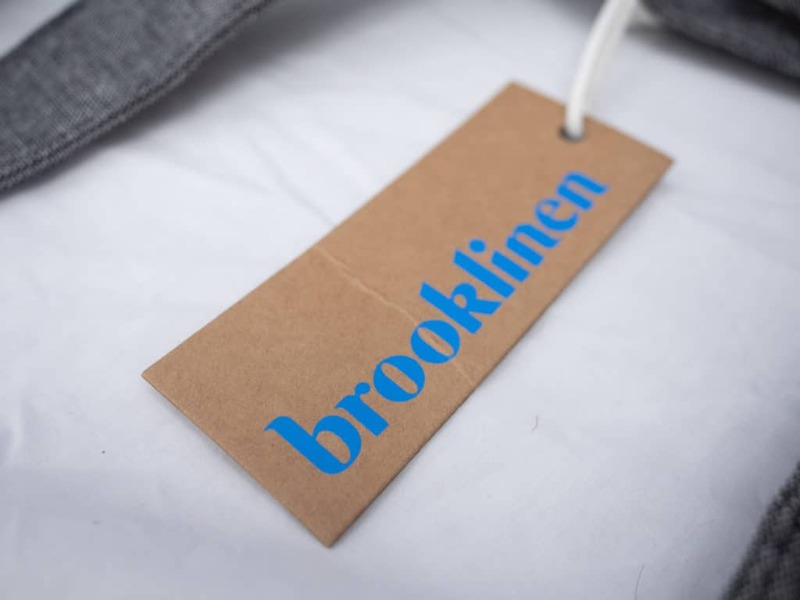 The most notable feature about the Brooklinen sheets, their lightweight feel. These sheets are light enough to stay cool, avoid sticking to you, and keep you comfortable throughout a sleep cycle.